There is a stream which flows over clean, sparkling gravel. A stream which bends and turns through an evergreen forest, sweeping deep beneath the overarching cedar trees, chattering softly through the riffles and flowing quietly through long, deep pools. There is a trail winding along this stream which leads through a cedar bog, and emerges from among the tag alders at a pool. Across the way a cabin perches on a patch of verdant green grass that flows down the slope to the stream edge. The cabin is as green as the grass upon which it sets, and the forest which surround all of it is equally green. A log lays firmly lodged in the bed of the stream. Lying parallel to the flow it provides a perch where a heron, or a human, can set and contemplate. From this perch both bird and man may watch for the flash of a trout as it turns to take a nymph, or the slight dimple as a dainty morsel is intercepted on the surface. 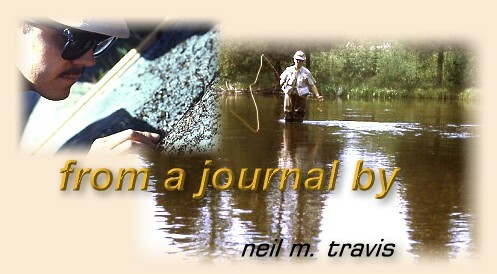 The trout are there, butter colored browns, silvery rainbows, and brightly spotted brookies. At times they cover the water with dimples, but sometimes it flows past, in an unbroken, undulating ribbon. I know that the stream is there, and that the trail still winds through the cedar bog, though I have not seen the stream or trod that trail in over 30 years. I trust that the trout are still there, though I hear that they are not as they were then.